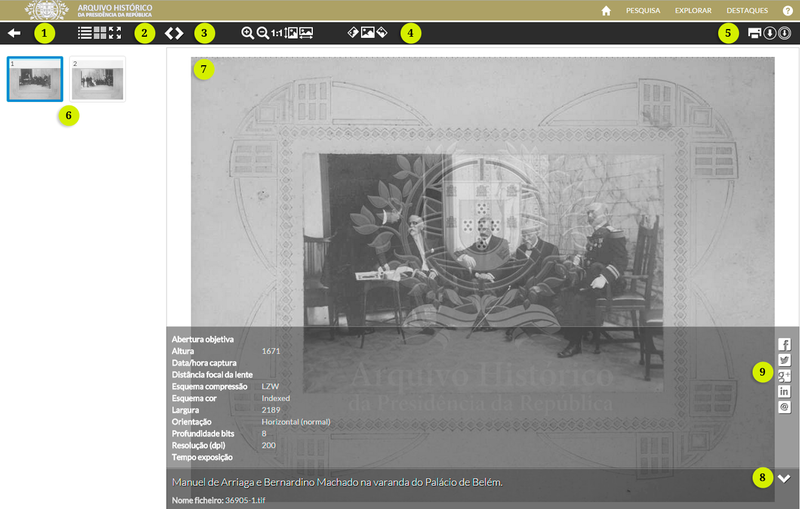 This web portal enables you to locate documents available in the archival institution. 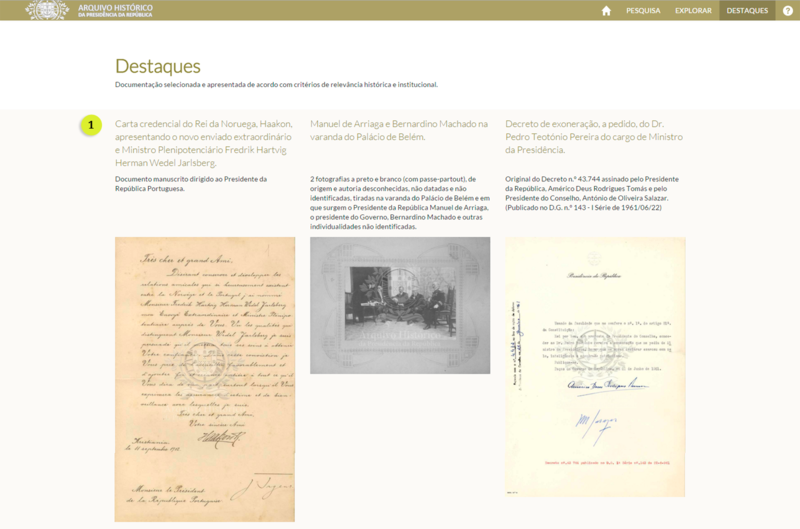 In the welcome interface, you will find a brief presentation of the Historical Archive of the Presidency of the Republic and respective fonds, enabling a direct connection between them. The search page is divided in two parts: basic search and advanced search enabling the user to combine a wide range of criteria. In its simplest form, a text box will be presented to the user, where they can state the terms that best describe the desired documentation. This option will search the terms in the metadata records, regardless of the field where they are present (1). Contains all words: it's the default option, and searches for documents containing all filled terms. 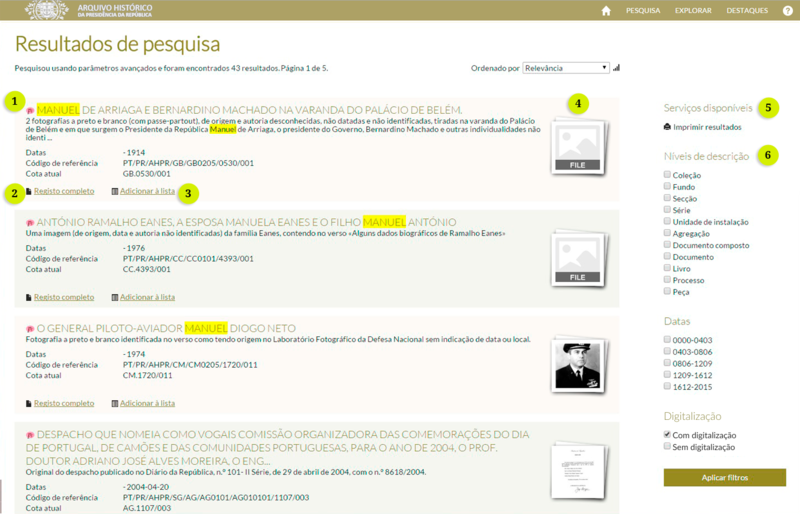 If you enter, for example, the term "inquisition Lisbon" you will retrieve records where the terms "inquisition" and "Lisbon" are present in the title field, and the terms can be adjacent or separated. Contains exact phrase: similar to the previous option, but only searches for documents containing all terms adjacent in the indicated order. Contains any word: searches for records that have at least one of the requested terms. If you enter the term "inquisition Lisbon", it will be retrieved records where the title has the terms "inquisition", "Lisbon" or "inquisition Lisbon". Does not contain exact phrase: similar to the previous option, but only omits results that contain the selected adjacent terms. Contain one of the dates in the provided period, even if the other date is outside that scope, e.g. records with an initial date of 1810 and final date of 1900 will be retrieved. Note that in this case the final date is outside the indicated period, but not the initial date. For this reason the record is recovered. In this option, search will focus on a specific field, instead of searching in all of the existing description fields. This field allows you to search by the reference code (5). If you possess this value, it will be the best way to retrieve the record you are looking for. All the fields listed above correspond to the fields that are used in frequent searches. However, the user can add more fields to the search by clicking "Search other fields." Each time you click, a new field is added to the search form. You may change the selected field to where you want to focus the search, the search terms and the type of search you want the system to perform (explained above for the "Title" field) (6), or scope and content (7). 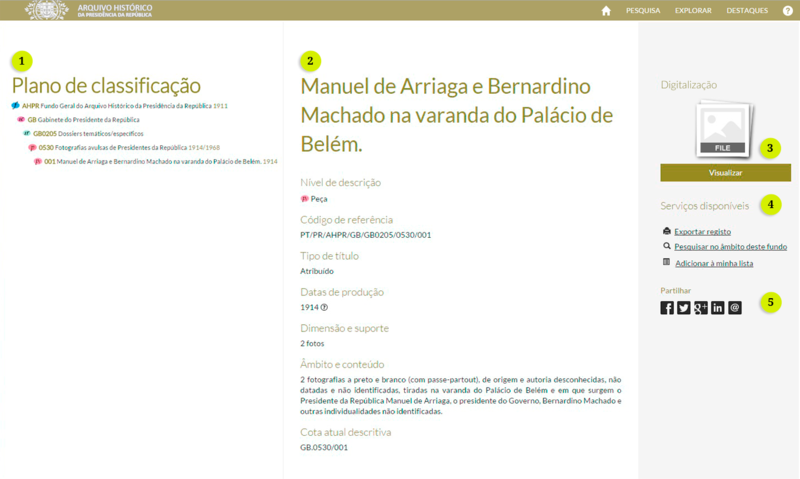 You may also search for the description level(s) of the document (8). The documentation is organized according to a structure of archival description that goes from the general (Fonds or Collection) to the specific (Composed Document or Simple Document). The results presented will always be derived from the combination of all the selected search criteria. When the user has doubts about the accuracy of the selected criteria, it is wiser to remove it in order to get the expected result. 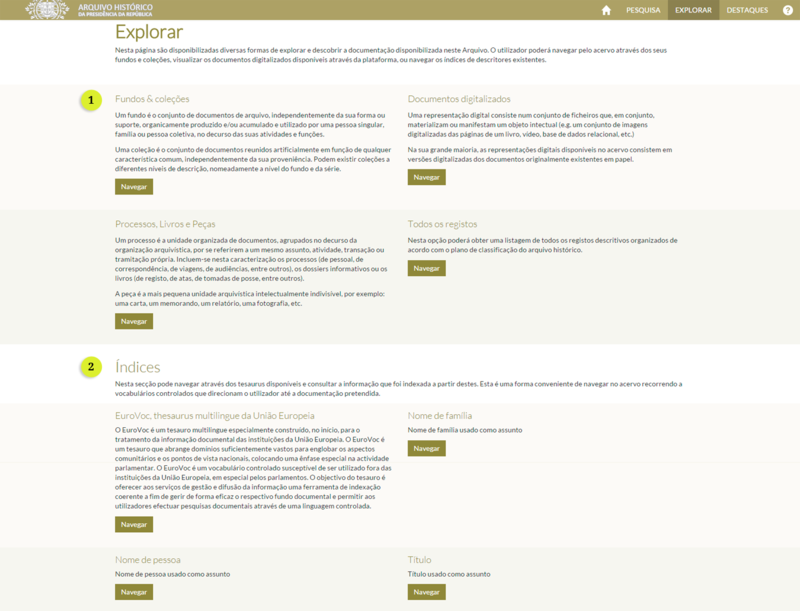 The "Explore" option aims to present pre-defined searches or help navigation in controlled vocabularies, visualizing the relations and associated documentation for each term. In the area of pre-defined searches a set of searches returning a given set of records are selected (1). Helps the search of all fonds, or all records with digital representations associated. Through the controlled vocabularies navigation (2), besides visualizing the terms that compose a given vocabulary (and respective hierarchy), we can also directly access all the records that may be associated to each term. The "Highlights" option aims to present predefined searches, or present information that is intended to enhance for any particular reason (e.g. a temporary virtual exhibition).